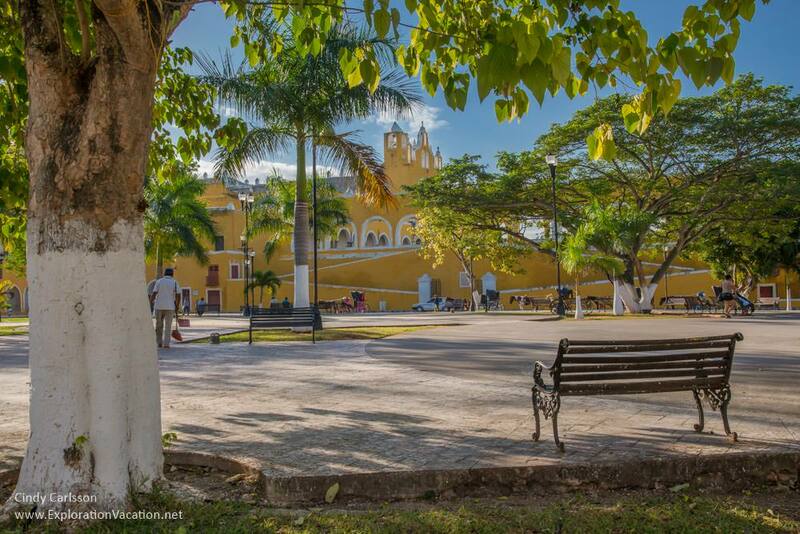 Izamal wakes slowly. While the sun is already illuminating the facades of the city’s egg-yolk yellow buildings, the streets are still largely empty. Over at Itzamna Park, the morning maintenance workers are sweeping away the debris of yesterday. Soon the park will ready for the day. Although there are few tourists out yet, the city’s calesas (horse-drawn carriages) are beginning to line up along the square and wait for customers. There don’t seem to be any English-speaking carriage drivers around, but even if there were, the practice seems to be to take the carriage at the front of the line. This system ensures everyone a bit of work if they are willing to wait long enough. 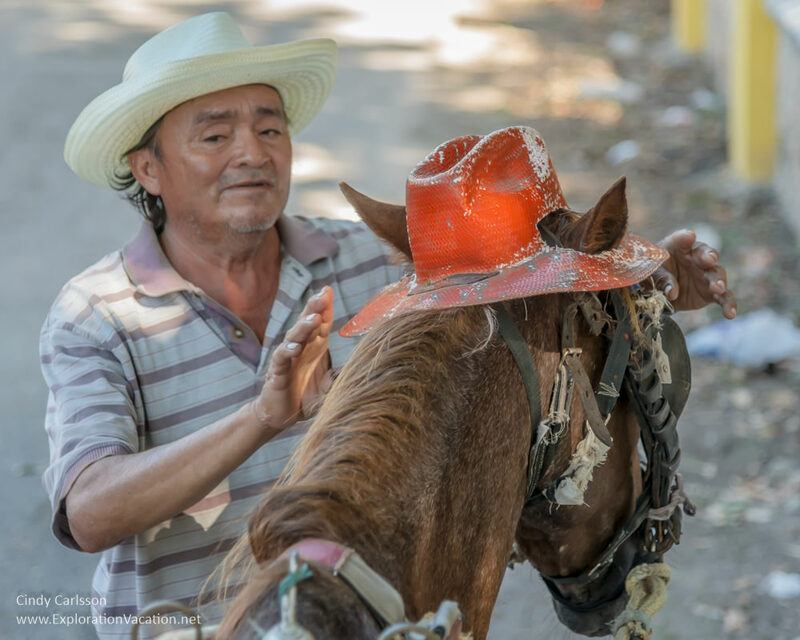 These men and their horses spend every day together whether there are customers or not; surely their lives are improved by cooperating – rather than competing – with each other. Our driver greets us in Spanish and settles us into the carriage. The carriage itself is a bit worse for wear, but cheerfully decorated with fake flowers. Once we are in place, he turns his attention to his horse, ensuring the both the carriage harness and the horse’s hat are properly set. And then he climbs up to the driver’s seat and we are off. The streets around the convent are starting to get busy, but soon we are traveling through quiet residential areas. Along the way our driver turns and shouts back to us a bit of information about the buildings we pass. I understand that these once served the lives and work of important people, but little more. Our first stop is at the completely unrestored Mayan pyramid El Conejo (The Rabbit). El Conejo doesn’t look like much more than a pile of rocks today and its purpose remains obscure as well. A number of household items not ordinarily associated with Mayan temples (including small tools, spindles for spinning, and plant pots) have been found at this small building site. It’s unclear who once lived here. Our tour continues, clip-clopping past small homes and shops in a quiet corner of this small city. 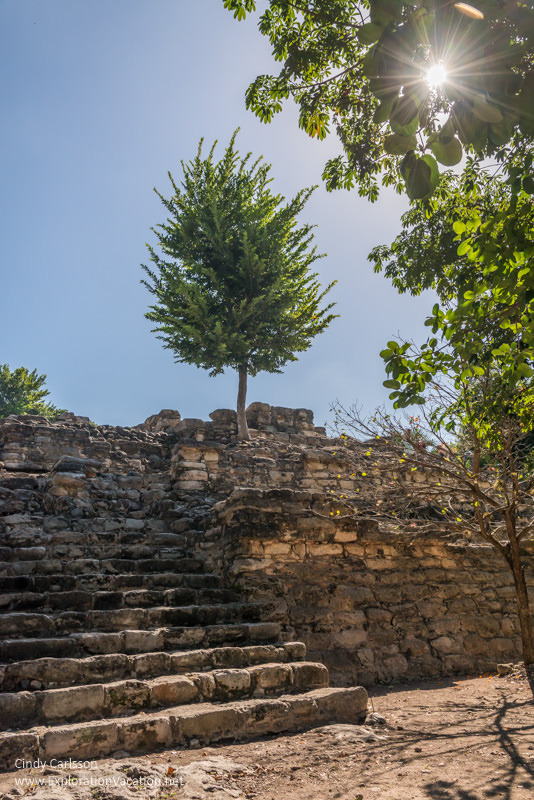 Our next stop is at the ancient Mayan site of Itzamatul. Dedicated to the god Zamná or Itzamná (a ruler of the heaves and sky), this was once an important pilgrimage site. Construction here occurred in three phases, each of which built on (or over) existing structures to expand the site. Today a restored staircase hints at the grand architecture of the past. 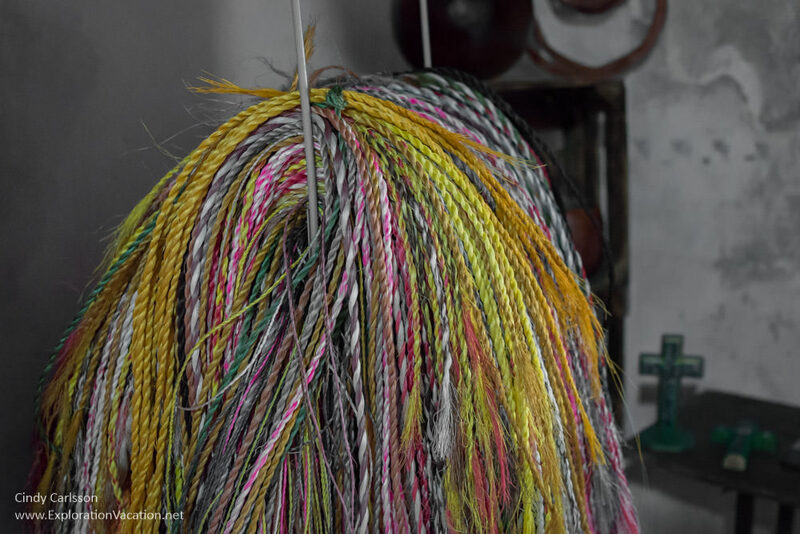 Generally the carriage tours weave a route that stitches together a selection of the city’s Mayan ruins and a variety of small craft shops. But we started our tour before the craft shops were open. So now, as mid-morning approaches, we stop along the other side of Itzamatul where a small shop overflows with all sorts of items made of henequen. There are the usual hats and bags, but there are also playful items like giant flowers and framed works of woven art. Some of the work (done by the wife and family of the shop owner) is absolutely amazing, but I have no space for anything back at home, so I only buy a few of flowers to keep or give as gifts. Then we clamber back into our carriage and continue on. As we roll along we pass what appears to be another enormous ruin. It looks impressive and I wonder why we aren’t stopping . . . But soon enough we do stop. We are at an entrance that lets us into the site via an enormous stairway. This pyramid is dedicated to the sun god Kinich Kakmó, which probably explains the little sun figures carved into the stairs in various odd spots. The pyramid seemed enormous as we traveled around it because it is enormous. 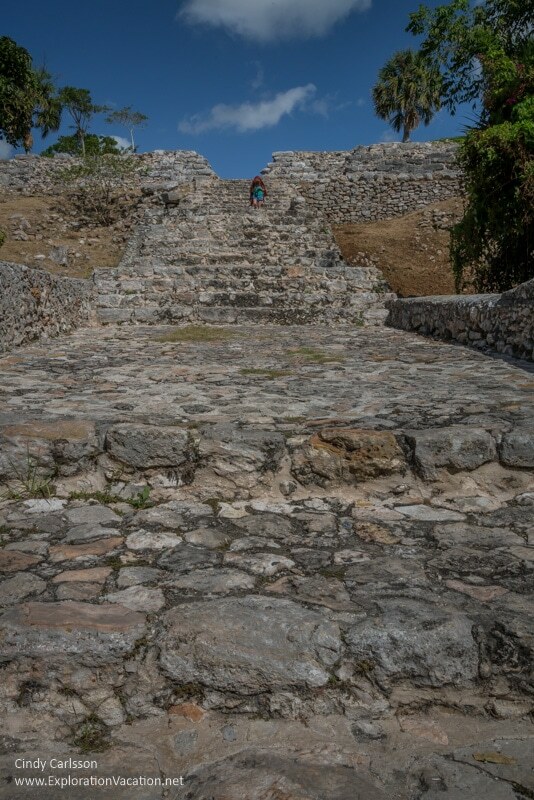 It is one of the biggest – if not the biggest – Yucatán pyramids in both height and volume. It’s so big that, until I climb most of those stairs, I can’t even see the top to know that more awaits up above! We don’t actually climb the uppermost pyramid, but there’s not much need to. We have wonderful views of the city right where we are. Our carriage awaits us back down at the street. We know that we are coming to the end of our tour and it’s clear from the stepped-up pace as we roll off that our horse is eager to finish up this tour! Soon we are back in the plaza and our carriage tour is over. Calesas line up to await customers along Itzamna Park near the convent. 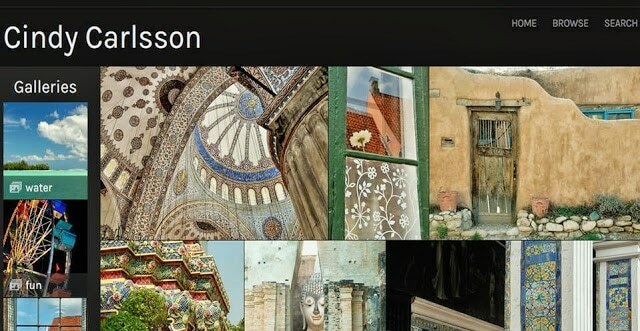 There is no need to book a tour in advance or pay a tour company to arrange your tour unless there are specific sites you want to see and you don’t speak Spanish. The tours generally include a variety of craft shops, but we weren’t looking to visit craft shops so were happy to just stop at one. Our driver gave us a nice overview of the town and was content to wait for us while we explored the ruins. But we were also touring on a very slow day when he knew he wasn’t missing out on other customers; the pace might not be as relaxed on a busy day. You can also negotiate with the driver to extend your tour or add specific sites to your tour. 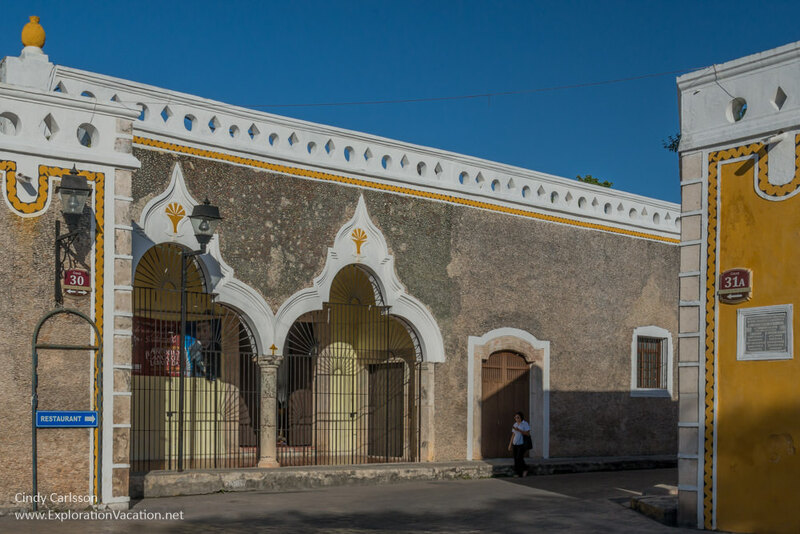 We visited Izamal late in 2014 as part of a brief tour of the Mexican Yucatán. Yeah, animals in oher parts of the world have a pretty hard life. They rest the horses in the shade when it’s available and seem to have water for them along the way, but it’s a still a pretty poor place so animal care is pretty basic.